Published January 23, 2019 By Anna T. This post may contain affiliate links. Regardless, I only recommend sites I've researched and/or used and trust. Smartphones are incredibly addictive. It's almost dangerously easy to spend hours and hours in a trance, staring at the little screen with all your attention devoted to Youtube, Facebook, or Twitter. Don't get me wrong – this isn't necessarily a bad thing as long as you also find enough time to get important tasks done. But, wouldn't it be great if you could use some of those hours on your smartphone making a little bit of extra cash? Of course, it would! Luckily, earning cash with your smartphone is absolutely possible. There are quite a few neat little apps out there, for both Android and Apple phones, that will pay you real money to do fairly easy stuff like playing games, watching ads, uploading pictures, and answering questions. Most of these services pay out via a point-based scheme where you use virtual currency to buy gift cards, and it can sometimes take quite a while to earn anything substantial. But the tasks aren't usually that difficult; a few are actually pretty fun, and others are at least interesting enough to keep your mind occupied for a little while. We already have a massive list of 75 smartphone apps that pay you, but today we wanted to focus on the most popular offerings with fairly high user ratings so you can avoid scams and get the best experience possible. One of the most popular, and highest rated shopping apps out there. Earn coupons and discounts that help you save money on groceries. Before you go shopping, you perform simple tasks that give you access to deals and rewards for certain products, then you scan your receipt to prove you bought the items, and Ibotta credits your account with money. The app has a 4.5 rating on both the Apple and Google Play store, so people seem to love it. Go here to learn more about Ibotta. This is a popular rewards website, with a highly rated app, available for both Apple and Android devices. You can earn rewards for surfing the web, watching ads, reading emails, taking surveys, and a wide variety of other activities. Go here to learn more about Inbox Dollars. This is a neat app similar to Inbox Dollars that makes it possible to get paid for playing games, searching the web, watching videos, and much more. They will let you cash out for most gift cards and Paypal cash at just $5, so it's pretty easy to get regular rewards here. Go here to learn more about the Swagbucks app. The goal behind this app is to help you earn rewards regardless of location. If you're sitting around the house, you can earn by watching videos, playing games, or taking surveys. If you're out in the world you can earn in other interesting ways, such as scanning barcodes. Checkpoints is available for both Apple and Android devices, but the Android version has a higher user rating. Go here to learn more about Checkpoints. Download various phone apps and try them out to earn points you can redeem for a Paypal deposit or a gift card from a selection of big online retailers. Very simple concept and the app is quite popular. Available for Android devices only. Go here to learn more about AppKarma. This is probably the most highly regarded survey app. You'll be answering questions about products, entertainment preferences, politics, and a wide range of other subjects. The program is available for both Android and Apple machines. Both versions have high ratings and tons of great user comments. One big edge for this app that puts it head and shoulders above most similar programs is that it pays cash instead of relying on a points system. Go here to learn more about Surveys on the Go. Another Survey app with both an Apple and Android version, both rated 4.1 by users. You get paid via gift codes delivered to your email. Must earn at least $10 to request a payout. Go here to learn more about Quick Thoughts. This fashion selling app has a 4.7 in the iTunes store and a 4.3 on Google Play. You can use the program to browse and purchase used clothes so that alone might be enough reason to download it. But the real draw is the chance to sell your own stuff by setting up an online “consignment closet” where you put all the old things you don't want anymore. Other users searching will find your items, and depending on how desirable they are, you'll occasionally get a sale. Poshmark also has a very functional web interface, which some might prefer for listing items for sale, but the mobile version makes it really easy to access your user account while on the go. Go here to learn more about Poshmark. They describe themselves as the largest online fashion and thrift store. You sell your items by sending them a bag full of old clothes; they decide which ones they actually want to keep and list them on the site, sending the rest back to you. The key to really making money with ThredUP is to send them a large volume of stuff, preferably name-brand items, because the profit margin can be kind of slim. You can use their built-in payout estimator to get a sense for how much you'll make on a given item, which is pretty convenient. Just like Poshmark, there's both a web interface and app versions for all types of devices. Go here to learn more about ThredUP. This app has an interesting concept. Basically, they pay you to watch programs, both on live TV, and through streaming networks. While you watch they'll send you trivia questions (presumably to make sure you're actually paying attention) and give you points for correct answers, which you can redeem for gift codes. The Google Play app has a very high score, but the iTunes version has gotten a much worse reception from users, so keep that in mind before you download. Go here to learn more about Viggle. We hope you found some interesting apps on the list above. 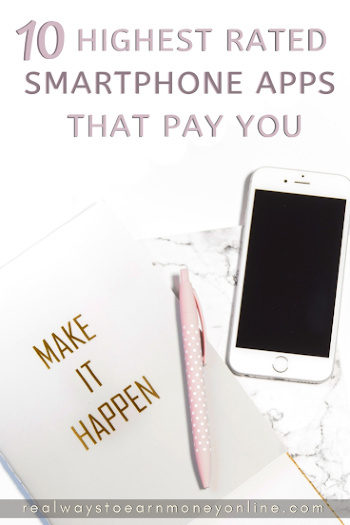 Obviously, you'll never be able to quit your day job with the kind of money you make with these apps, but the payouts can be a nice bonus every once in a while, and if you love spending time with your smartphone anyway, it doesn't hurt to earn a few cash rewards in the process. If there are any other apps you think we should've included, or if you have an opinion about one of the services listed above, give us a shout in the comments section below. We'd love to know what you think. Quick Thoughts is my favorite out of all of these.. quickest way to pay out that I have seen. Qualify for survey and get $2.00. Don’t qualify and get .10! I have cashed in over $50.00 for Amazon gift cards in less than 2 months. 5 stars from me!